Dislocation of the collarbone at the shoulder blade, often caused by a fall on the corner or rear of the shoulder. Another name for it is an: acromioclavicular luxation (dislocation) - Shoulder corner luxation. In the case of a fall directly on to the shoulder (as in a cycling accident) not only is it possible to break your collarbone, but frequently the ligaments (collateral ligaments) that connect the collarbone to the acromion (=part of the shoulder blade) completely tear off. In the latter case the patient has an obvious lump on top of the shoulder. This is an AC-luxation. The symptoms vary significantly, ranging from mild pain across the joint to severe, marked pain in the joint in a grade three injury. A relatively pronounced swelling may also occur in the shoulder. After a while localised bleeding may result in bruising. With a grade three injury there is a clearly visible lump and a piano key sign: when pressure is exerted on the end of the collarbone it sags, when we release it the bone immediately springs back up, just like a piano key. A thorough clinical examination and patient history can establish a correct diagnosis. X-rays will also be taken to diagnose the injury. In some cases it is necessary to hold a weight in your hand to demonstrate the injury more clearly. Type 1: bruising/strain of the AC joint with no real ligament tears. Type 2: Tear in the capsule around the AC joint. Type 4: The collarbone also perforates the muscles, which partially tear. Type 6: Idem, but the collarbone moves downwards. The decision of whether or not to operate depends on a number of factors (degree of ligament tear, profession, age and patient’s choice of sport). Non-surgical treatment: Most AC luxations, mainly types 1, 2 and often type 3 as well, are treated conservatively. (This means with no operation): wearing a sling for a few weeks suffices. Treatment consists of a period of relative rest and wearing a sling, combined with applying ice to the area concerned and taking pain medication. Physiotherapy begins relatively quickly. On average, most of the pain disappears over the course of between four and six weeks, but may last for up to twelve weeks with more severe injuries. Complications: Complications involved in conservative treatment: persistent pain, cosmetically disturbing thickening, mild loss of strength, osteoarthritis in the long term. Recovery: Physiotherapy begins relatively quickly. On average, most of the pain disappears over the course of between four and six weeks, but may last for up to twelve weeks with more severe injuries! Surgical treatment: Some type 3 luxations, and most type 4, 5 and 6 luxations are treated surgically. 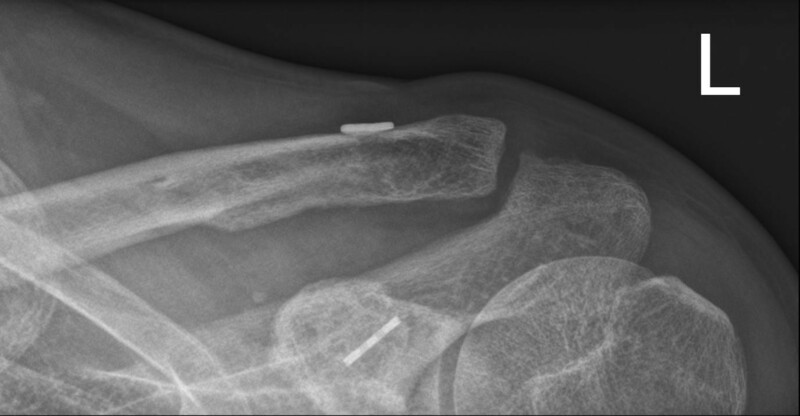 The joint is reduced, and the reduction is fixed in place using pins, threads, a synthetic band, or a screw (Bosworth fixation). The pins and screw usually have to be removed later on. The Weaver-Dunn operation is another option. It involves removing the end of the collarbone and the latter is pulled downwards by displacing a ligament (the coracoacromial ligament), in which a band or thread is generally placed around the collarbone and the coracoid. Complications: Complications involved in surgical treatment: persistent pain, osteoarthritis in the long term, infection, detachment of the fixation, slight reduction in strength, etc. Recovery: Patients usually wear a sling for a short period of time following a surgical procedure to treat an AC luxation. Pendulum exercises are recommended during the weeks following the procedure, but heavy lifting and raising the arm above shoulder height is not advised for the first six weeks. In some cases a physiotherapist is involved.